Wallbarn presents the biggest range of pedestals in UK. We have been producing and selling pedestals for 20 years the most experience in offering solutions for all suspended hard landscaping and surfacing requirements for flat roofs, terraces and walkways. Installers need look no further than Wallbarn. Free standing hard surfaces are created by suspending them on Wallbarn pedestals. 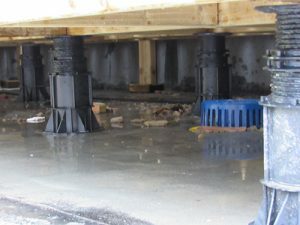 The deck surface beneath is not penetrated, protecting the waterproof seal. Roof systems are ballasted, well ventilated and free from surface flooding. The appearance of the roof space is improved and the building footprint is optimised. 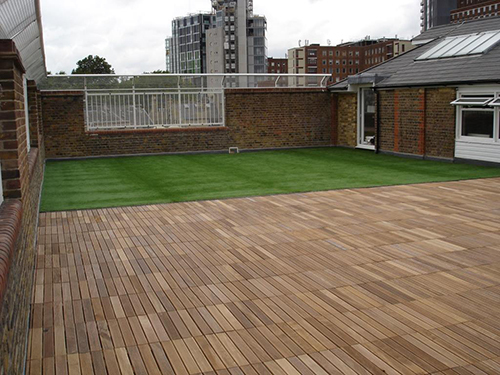 Our range includes support systems for both paving slabs and timber decking manufactured in a range of materials for use in many different applications and for different design constraints. High quality, hard wearing pedestals are available in 100% polypropylene and rubber. From fixed height pads up to our extended height Megapads, we can match the product to the application required perfectly. Wallbarn offers the largest height range available. 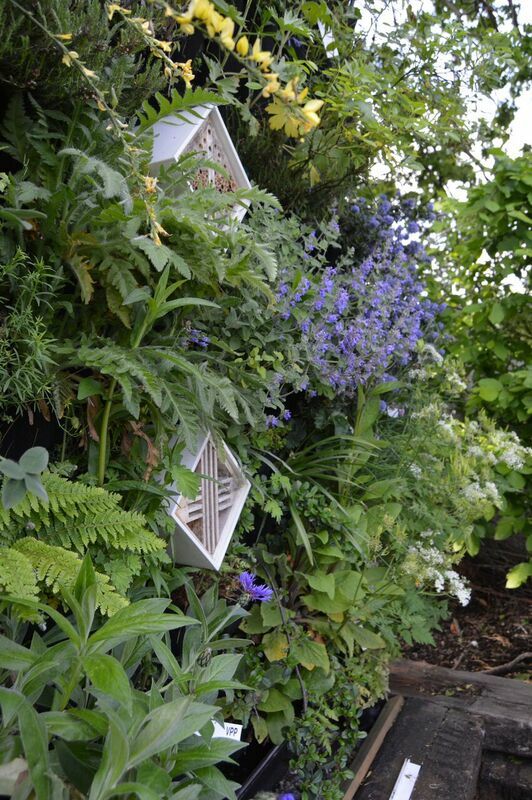 Our support pads start as low as 5mm and we can supply pedestals at over 1 metre in height. Our adjustable range of pedestals allows installers to alter the height of the upper surface whilst the paving slab or timber decking is in place. Instead of having to constantly remove the upper surface, heights can be changed to create that superior flat level. This speeds up installation radically and avoids too much heavy lifting. 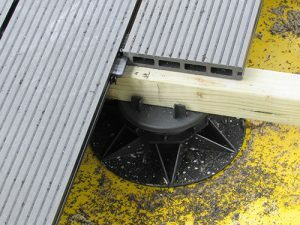 Large baseplates distribute the weight of the slab or decking evenly and prevents point loading beneath. The head pieces give a secure housing for the upper surface. Paving slabs are held between four positioning lugs which prevent movement, allow drainage between each slab and give a straight paving line. For timber decking projects, the head pieces house a timber joist between the lugs. 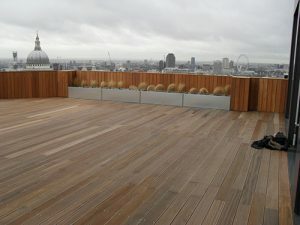 The decking boards will be fixed to the joists, which being suspended rather than fixed to the pedestal, allow the timber a certain amount of flexibility. Wallbarn supplies adjustable pedestals for either paving slabs or timber decking in a height range from 10mm up to 1,020mm. 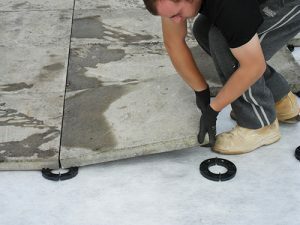 Rubber plates can also be fitted to these polypropylene units for sound and vibration insulation. Wallbarn pedestals will not crack in cold weather. Our pedestals have been strength tested in temperatures as low as Minus 40°C. Our products have been fully tested to their full warrantied life span. We do not use fillers in our production so users can be assured the materials are robust. 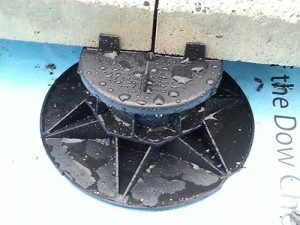 When we state the pedestals are 100% polypropylene, they are 100%. 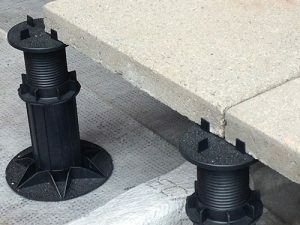 For ultra-low paving or decking applications, on refurb projects over existing finishes, for example; the fixed height support pads are ideal. Specially designed pads at 7mm height are ideal as they still provide adequate drainage even at these low height thresholds. The performance of the roof space has been designed into these pads. Wallbarn pedestals improve the performance of the building by allowing proper drainage beneath paving slabs and timber decking. 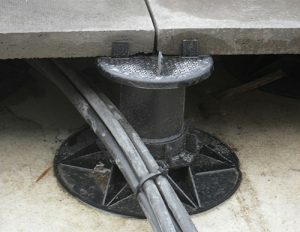 Surface ponding is prevented by rainwater draining beneath the upper surface. 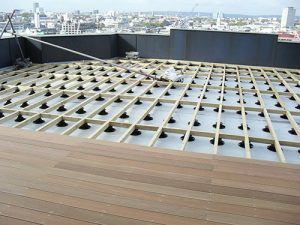 They give a fast, straightforward method of constructing highest quality pedestrian surfaces and help create the perfect solution for rooftop living.